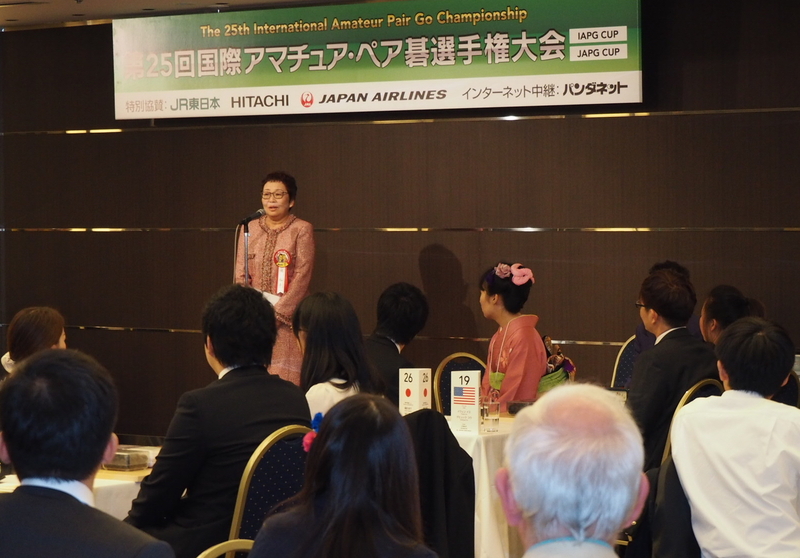 Nearly 100 Pair Go Promotion Partners and other guests gathered in Tokyo, Japan on October 24 to kick off a weekend-long celebration of the 25th International Amateur Pair Go Championships. Hisao and Hiroko Taki hosted a fabulous dinner at the Hotel Okura to celebrate the 25th anniversary of the founding of the Japan Pair Go Association and the Pair Go tournament. Mr. Taki is the inventor of Pair Go and the founder of the Japan Pair Go Association of which Mrs. Taki (right) is the current managing director. 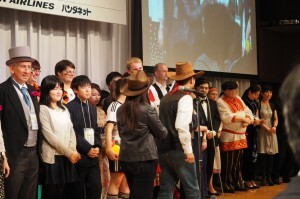 They held the formal dinner to thank everyone for their continuing efforts to promote Pair Go around the world. The Hotel Okura is a hotel established by and named for Kishichiro Okura, one of the founding patrons of the Nihon Ki-in. Tournament action got started on Saturday morning at the Hotel Metropolitan Edmont with the drawing of the opening round pairings for the 32 pairs representing 21 countries and territories. The US pair, Yiwen (April) Ye and Daehyuk (Daniel) Ko, drew a difficult first round matchup and fell to one of the strong Japanese pairs. Two special events occurred on Saturday afternoon. The first was the traditional annual Goodwill Game, a popular single-round Pair Go event allowing the attending professionals, Pair Go Promotion Partners and other invited guests an opportunity to enjoy a Pair Go game during the weekend. The participants in the Goodwill Game are encouraged to wear traditional national costumes (right), which makes the atmosphere of these friendly matches even more enjoyable. Sunday was another very busy day with three separate tournaments occurring simultaneously. The 32 pairs involved in the main Pair Go Championship had a long day with Rounds 2 through 5 this day. In the end, the final match pitted Lin Hsiao-Tung and Lai Yu-Cheng from Chinese Taipei against Kim Sooyoung and Jeon Junhak from Korea, with the pair from Korea winning the championship. Including their loss in the first round, along with a loss to Hong Kong China, and wins against Switzerland, Thailand, and Serbia, April Ye and Daniel Ko (below) finished 3-2 for the tournament, earning a 16th place finish for the United States. In addition to the main tournament, the first World Students Pair Go Championship was held. This tournament matched eight pairs representing Japan, China, Korea, Chinese Taipei, and Thailand. At the end of three rounds, the final match saw Kim Hyun-Ah and Park Moon-Kyo from Korea defeat Hu Shih-Yun and Chan Yi-Tien from Chinese Taipei for the championship. The organizers from the Japan Pair Go Association and the World Pair Go Association plan on expanding this tournament to include pairs from additional countries around the world. Finally, a four-round open handicap tournament was held, attracting 129 pairs divided into three different sections. - report/photos by Todd Heidenreich, longtime director of the US Pair Go Championships.